WASHINGTON, DC -- Hillary Clinton said Wednesday that the United States should offer more financial and military aid to the Ukrainian government as it fights Russian-backed separatists, dismissing the idea that Kiev couldn’t be trusted with the money. The former secretary of state, who is likely to run for the White House in 2016, also praised President Barack Obama’s State of the Union address, saying it left the door open to compromise with Republicans, who now control both houses of Congress. Russia’s designs on Ukraine have badly soured Washington-Moscow relations, an area Clinton tried to improve in a “reset” policy during her tenure in Foggy Bottom. Clinton has already blasted Russian President Vladimir Putin in past forums, especially after Russia’s annexation of Crimea, once Ukrainian territory. At one point, she reportedly compared Moscow’s actions to Nazi aggression. “I think we should be putting more financial support into the Ukrainian government,” Clinton said during a paid speaking engagement in Winnipeg, the first of two such appearances in Canada on Wednesday. Clinton added that Ukrainian President Petro Poroshenko is doing “everything he knows” to shore up Ukraine’s finances but that the former Soviet country also needs more military aid. “I do think we should do more to help Ukraine defend its borders,” she said. She added that the U.S. and Ukraine should do more to reassure Ukrainians with affinity for Russia that they will be enfranchised if they remain Ukrainian subjects. 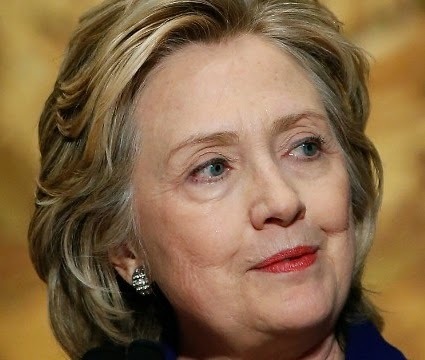 Clinton also spoke of the president’s State of the Union address, which he delivered Tuesday night, saying that the agenda Obama laid out included areas of possible compromise with the GOP. She cited the Democratic president’s plan to offer Americans two free years of community college, saying that Republicans who don’t fully support the idea might still support broadening access to higher education and agree to partial funding. “Those are business transactions,” she said of the potential horse-trading on Obama’s proposals. Consistent with her previous statements, Clinton declined to comment on the Keystone XL pipeline, a hot-button issue north of the border. She spoke again Wednesday evening in Saskatoon, Saskatchewan. Both appearances are sponsored by the Canadian Imperial Bank of Commerce.